All Sport Pilot questions arranged by subject into chapters with Answers, Explanations (for correct and incorrect answers) and Reference Codes. Helpful test instructions, tips, excellent cross-references, and more included. 136 pages. The FAA tests are on a one-year cycle, with changes made up to 3 times a year. We make sure you have the most current information by publishing the books annually, posting updates on the ASA website that show changes made to the test questions, and providing a free e-mail subscription service for automatic notification when Updates are available. ASAs Test Preps contain the FAA questions and answer stems — plus answers, explanations (for both correct and incorrect answers), references, and FAA subject codes. Chapter text and illustrations help you more fully understand the concepts. Sport Pilot Instructor and Examiner applicants should use the CFI Test Prep to prepare for your tests. The CX-2 complies with Advisory Circular (AC) 60-11, Test Aids and Materials that May be Used by Airman Knowledge Testing Applicants. 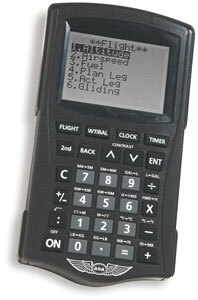 Users may bring the CX-2 with them to the testing centers for all pilot, mechanic, dispatcher, and FAA exams. Aviators can calculate true airspeed, ground speed, mach number, altitudes, fuel, headings and courses, time/speed/distance, winds, headwind/crosswind components, gliding information, and weight and balance. Users can change variables and recompute without re-entering the whole problem. Functions can be used together in “chain” calculations, where the answer to a preceding problem is automatically entered into subsequent problems. Standard mathematical calculations and conversions can be performed within each aviation function. The CX-2 uses four AAA batteries (included), and features a 5-year warranty. Please see the CX-2 Demo, and try it out for yourself. This online version is fully functional so you can see exactly how the CX-2 works. ASA has built a reputation for providing the aviation community with the most accurate and reliable FAR/AIM products available. 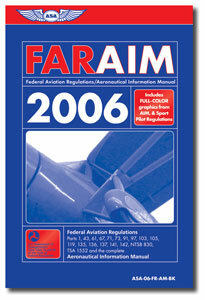 The 2005 series continues this tradition, with books that contain complete and up-to-date information from Title 14 of the Code of Federal Regulations (14 CFR) and Aeronautical Information Manual (AIM) and a free e-mail subscription service for you to receive updated information as it is released by the FAA. Parts 1, 43, 61, 67, 71, 73, 91, 97, 103, 105, 119, 135, 136, 137, 141, 142, NTSB 830, and the complete Aeronautical Information Manual. Sport Pilot rules included! 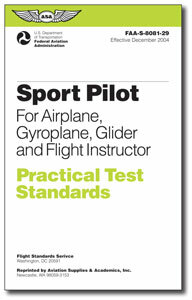 FAA Knowledge Exams: Sport Pilot (for all light-sport aircraft) test included. More than a "question and answer" recounting of test questions, it's the essential tool that combines a powerful software program with the accurate and instructional material you expect from ASA. Electronic updates that you can download from the ASA website keep your database current as the FAA makes changes to the tests! Free e-mail Subscription Service provides automatic notification when Updates are available. 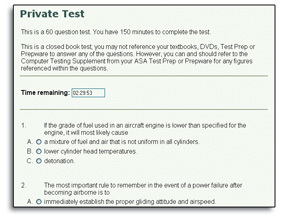 Also included is the instructor utility, QuizMaker, to generate pop quizzes or exams using actual FAA questions. Quizzes can be of any length and on any specific or combination of subjects. You can print exams, student answer sheets, and instructor master correction keys for quick grading, or save the tests in the software so your students can take these electronically. System Requirements: IBM-compatible personal computer with a Pentium 166 or higher processor, Windows 95/98/ME/NT/2000/XP, 32MB RAM, 10MB hard disk space, CD-ROM drive, 800x600 SVGA video adaptor & monitor, and mouse. 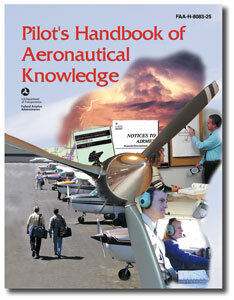 This FAA handbook has been required reading for pilots for more than 25 years. Written for the applicant preparing for the Sport Pilot, Private, Commercial, or Sport Pilot Certified Flight Instructor Certificate. It is also valuable to Sport Pilot Certified Flight Instructors as a teaching aid. Providing basic knowledge essential for all pilots—from beginning student pilots to those pursuing more advanced pilot certificates—this book introduces pilots to the broad spectrum of knowledge that will be needed as they progress through pilot training. Studying this book, pilots gain the required knowledge to earn a certificate, and can understand the theory associated with flying an airplane. It is a key reference tool to all the information necessary for operating an aircraft. Subjects covered include principles of flight, aircraft and engine structure and systems, weight/balance and performance calculations, charts and navigation, weather theory, weather reports, forecasts, flight manuals and other documents, use of computers, and aeromedical factors and decision making. 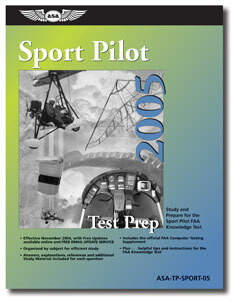 Includes a FREE Sport Pilot Study Guide downloadable .pdf file. Be sure to download it at time of purchase! The Practical Test Standards are a guide for students, instructors, and FAA-designated examiners to know what is expected of pilots in a check ride. 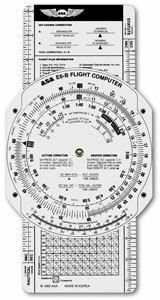 ASA reprints the most current FAA Practical Test Standards in this series of handy cockpit-sized guides. 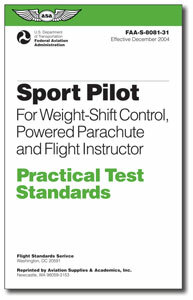 This ASA Practical Test Standards book for Sport Pilot Weight-Shift Control (Trikes), Powered Parachutes (PPC), and Flight Instructor is written by the FAA and details the type and levels of skill and knowledge that must be demonstrated before an examiner can issue a certificate or rating to an applicant, and describes background study and reference materials. ASA reprints the most current FAA Practical Test Standards in this series of handy cockpit-sized guides. ASA’s Sport Pilot Practical Test Standards for Airplane, Gyroplane, Glider and Flight Instructor is written by the FAA and details the type and levels of skill and knowledge that must be demonstrated before an examiner can issue a certificate or rating to an applicant, and describes background study and reference materials. 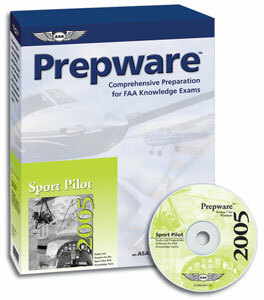 The experts in FAA Knowledge Exam preparation bring you a website dedicated to practice tests. These practice tests give you the confidence you need before heading to the testing center, and save you money on test re-takes. Pilot applicants have the option to use these tests to acquire your test sign-off from ASA staff, or print your results to show your flight or ground instructor for their endorsement. Realistic test simulation; uses the actual FAA questions, number of questions, and time allowed for your certificate or rating. Get your Sign-off — Pilot applicants can email your results to ASA to receive your sign-off and graduation certificate or print results for your flight/ground instructor to endorse. Either way you have everything you need to schedule your exam with the testing center. Gain the confidence you need, and save yourself the hassle and expense of retaking exams at the testing center. You can take 5 practice tests. Submit 2 of the 5 practice tests with scores 80% or better to receive your sign-off (AMT applicants taking the General, Airframe, or Powerplant tests will receiva a frameable certificate of completion).